This garden cart is attractive and portable and perfect for all your gardening needs. The vented and solid shelves are interchangeable. Includes a 4" deep bin for mixing soil, 2 shelves and slots for your tools. This Cub Cadet 1200 Lb. Steel Dump Cart is a great lawn and garden trailer for getting rid of yard refuse, hauling firewood, moving sand or dumping gravel. Reinforced tailgate guides offers added strength for loading and unloading heavy objects. Easy one-lever release dump mechanism. The universal hitch easily fits all tractors and many ATV's and UTV's and cart has weight capacity of up to 1200lbs.. Heavy-duty industrial wheelbarrow with rolled edge seamless steel tray and safety baked enamel finish. Welded tray clips, funnel tray with easy pouring lip. 4-ply 16" (40.6 cm) pneumatic tire with inner tube, roller bearings with Zerk fitting. Oversize 3/4" (1.9 cm) steel axle. Heavy-duty steel undercarriage with tray braces and leg stabilizers. Garden Cart This garden cart is attractive and portable and perfect for all your gardening needs. The vented and solid shelves are interchangeable. Includes a 4" deep bin for mixing soil, 2 shelves and slots for your tools. Garden Cart is rated 4.8 out of 5 by 35. Rated 4 out of 5 by pat from Easy to put together. Looks great and functional. The reason I gave it a 4 star was because it is... Easy to put together. Looks great and functional. The reason I gave it a 4 star was because it is hard to push in the grass. Rated 5 out of 5 by Sue from This is a great cart -- very sturdy and handy for potting and for holding hand tools and a few po... 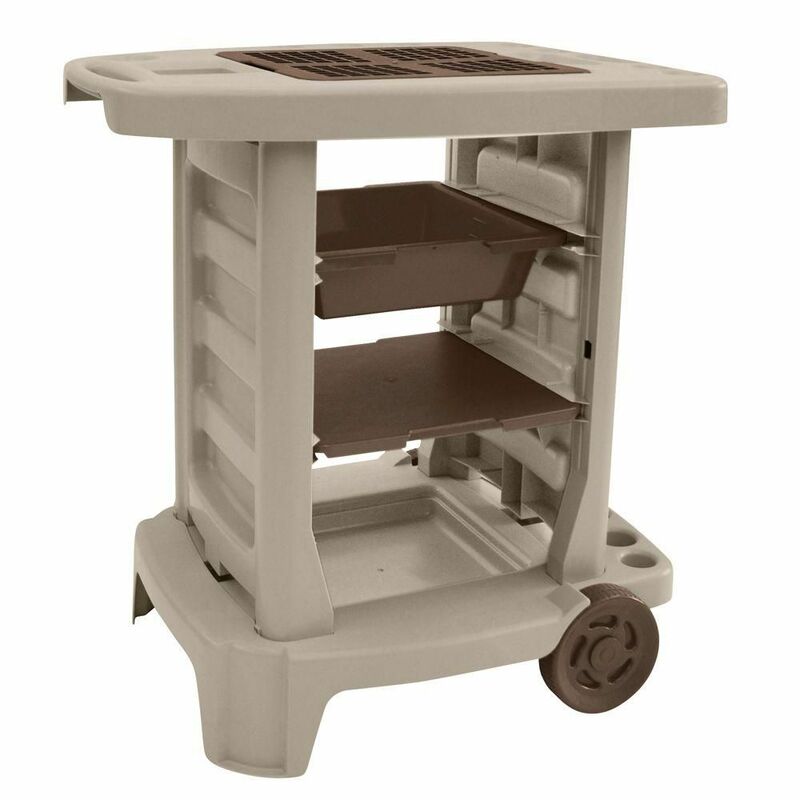 This is a great cart -- very sturdy and handy for potting and for holding hand tools and a few pots and a bit of fertilizer, as well as soil in the top bin. Glad I bought it! So easy having everything together so I can quickly pot only one or two plants, if that's all I need to do at one time, instead of procrastinating because it was such a nuisance before, getting everything out. I do put a makeshift cover on top when rain comes; including one with the product would be a design improvement. Rated 5 out of 5 by Janet from Super easy to assemble, light weight but sturdy and not top heavy. Love that I can easy move it t... Super easy to assemble, light weight but sturdy and not top heavy. Love that I can easy move it to where I'm wanting to work in the garden, and having all my tools at my fingertips. I wish a cover was offered for purchase during the winter months. I can see myself using this for many years to come! Rated 5 out of 5 by Gyneth from So easy to put together. Just what I was looking... So easy to put together. Just what I was looking for. Easy to maneuver. Rated 5 out of 5 by Kay from Have had mine for years and so gave it as... Have had mine for years and so gave it as a gift. Durable and functional. Love it! Rated 5 out of 5 by Dale from Love the look & usefulness of this, only thing I'd... Love the look & usefulness of this, only thing I'd improve on is covering the pull out drawer tray from rain. Rated 5 out of 5 by mg from Just what I wanted. Easy to put together. Love the fact that I can easily move it where I want it. I also like that the shelves are interchangeable. My only wish is that the workspace could be larger.